The mad rush was on! Glasses were being cleaned and stored, table arrangements finalized and the beer lines tested when, at just on 6 o’clock, in walks this red haired stranger. His name was Ray and he liked Labatt Blue. Ray lived just down the block from what has affectionately become known as “the Pub”. 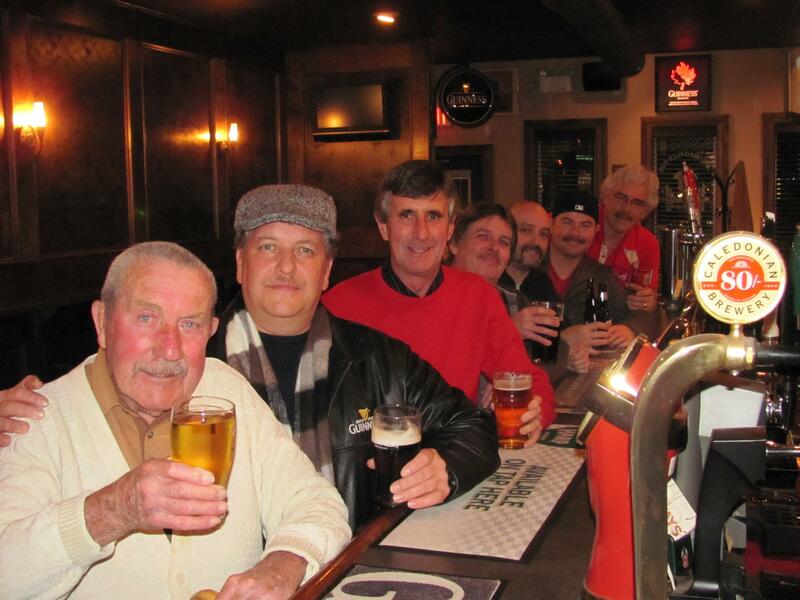 In the early days, Ray would come in a few days a week to enjoy his half pints of beer, the banter and to relax with friends. This has become a standard for many who feel at home in the Pub. Since the time McGonagalls opened its doors that first Hogmanay (the Scots word for the last day of the year) the décor of the building has changed and has been updated three times, but the feeling remains the same. Just as we set out to accomplish in the beginning, the ambiance of the Pub has become just like what most ex-pats remember of their local home, from the fixtures who discuss the merits of each other’s football teams to the folks who pop in for a pint on the way home from work to unwind. Back in the early days the front wall of the Pub was made up of 3 large plate glass windows. The door opened up to the stairwell and an obstacle course of dart boards. The bar itself was in the back corner with a bulkhead above. Behind the bar was the standard collection of bottles on the right. On the left, however, was something that showed all who stopped in what the Pub was. Row upon row of engraved personalized pint glasses, with names like Wee Bob and Funky Hunky, were proudly displayed… and rarely allowed to collect dust. Looking up to the bulkhead you could peruse the collection of coasters from around the world that were so lovingly stapled to ceiling. It only took a few years to see the folly of the door opening onto the stairwell, and the first transformation occurred. The door changed sides; the bar was moved to the opposite center and the darts to the back wall, thus ending the entry gauntlet. The beloved tartan carpet endured. Dave quite liked this relocation of the bar as he could now pull pints and not have to take his eyes off whatever football game was on. In recent times yet another makeover took place, this time at Ann’s hands. That long worn tartan carpet was removed (remnants remain as the backdrop for the dart boards) and woodwork was added to the walls, refreshing the look; but the banter remains the same. Characters are abundant in the pub. There is a special table across from the bar where tales are spun, wine glasses are common and we even allow Has ans. It has long been the type of place where you can find someone who knows how to do just about anything, from bricklayers to plumbers to geeks who can fix your ‘puter. As the eldest of the Dodds children I’ve had the opportunity to grow up, as they would say on Cheers, in a place “where everybody knows your name”. I’m not alone in that. My brother Steve has pulled more pints that could be counted and my sister Ann more or less runs the place now. We, along with our parents Dave and Ann, have all enjoyed these past 20 years of getting to know those in our community and thank everyone for all of the memories. The next generation of Dodds kids are in training, learning the theory of a perfect Guinness from our self proclaimed athlete.